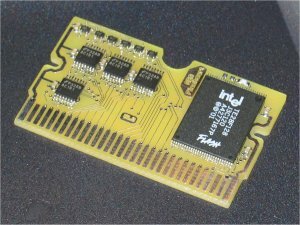 Based on the design of Timmy Brolin´s hombrew flashcart i developed a 128MBit basic flashcart without SRAM or EEPROM (see fig. 1). What is on the cart-PCB, can be seen in the schematic (pdf) and the placeplan (pdf). It is the same design, Timmy Brolin used (adress/data-demultiplexing with 74AC191 counters for random and sequential access), except that my cart uses a 128MBit Intel Strata Flash (TE28F128J3C120) and low-voltage single-gate-logic. If you manage to get the board data (Eagle V4.13 format) on a 1mm (originally 0.8mm) thick PCB, the board fits perfectly in a original cart housing. Mine has a thickness of 1.5mm, so i have to do a bit extra work to get a suitable cart-housing. As you can see in fig. 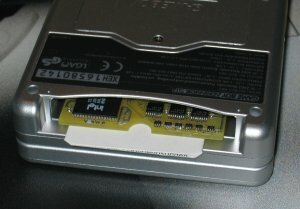 2, i used an old folded business card to do the first initiation of the prototype card, to fit properly into the cart-connector of the GBA. If you built a cart, the FLASH on it has to be programmed. What you need is a multiboot cable (e.g. a F2A USB Linker as i use. Maybe other MB-cables will work too...) and the apropriate programming software like Flashmanager V2.42 (local copy as sfx-zip) by Mootan (japanese page). This neat little shareware supports some multiboot cable types and nearly all available cart- and flash-types. Programming the FLASH is a bit slow but it works absolute reliable. So, don´t forget to donate this japanese guy and register the shareware. In fig. 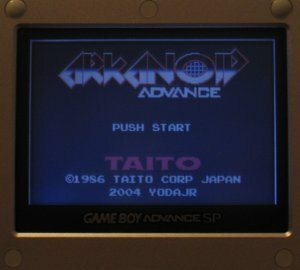 3 you can see a screenshot of the PD-game Arkanoid Advance by Yodajr running on my homemade flashcart. If you have questions about the project, you are invited to contact me (see the Legal page).